The heart of the Democratic Party is the precinct organization. These are neighborhood Democratic groups, devoted to making our neighborhoods better by raising up great Democratic candidates and getting out the vote in our neighborhoods. Your voting precinct — your Election Day polling place — is also your Democratic Party precinct. During the period from February 4-18, our precincts will be officially organizing — having important discussions about how to more effectively mobilize Democrats and Democratic-leaning unaffiliated voters in the precinct, electing precinct officers and delegates to the county convention, and collecting for the NCDP Sustaining Fund. This is your opportunity to get involved with the Democratic Party! 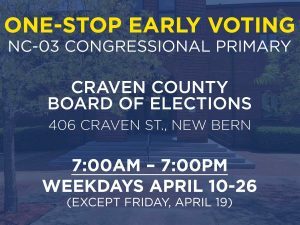 If your precinct isn’t listed above, contact 2nd Vice Chair Helen Robinson, who is informally leading our precinct organizing efforts, at 2nd.vice.chair@cravendemocrats.org.